"Something ugly was unravelling, beneath the appearance of normality." 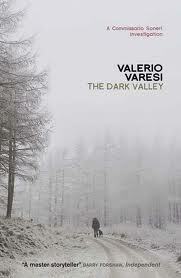 The Dark Valley is book number two in the Commissario Soneri mystery series and Varesi's second book to be translated into English. This book captured and held my interest throughout the story, not only because of the mystery and crime components, but because of Varesi's mastery of atmosphere and the way he captures a generation of people in a small village so perfectly. And kudos to whoever created the cover -- rarely does the outside of a book so perfectly capture the spirit of what's inside the novel. Commissario Soneri has reached peak stress level due to certain changes at his work, and by November, his partner Angela convinces him that he must get away. His choice is to return to the village of his childhood, a small place in the Appenines. While there he plans to hike into the woods on the slopes of Montelupo and hunt for mushrooms , an activity that he and his father used to share when he was a boy. He also hopes for some "peace and stability" there, thinking back to times when he would be with his father, "gathering chestnuts, firewood or mushrooms" and "the perfect understanding achieved between them with glances or gestures." But the idyllic setting soon becomes a hotbed of activity after he arrives. Someone has been putting up posters that say that a missing man has been located, a fact Soneri reports to Angela during a phone call. Although the man, Paride Rodolfi is apparently back home safe and sound, no one has really seen him since his return. Angela suggests that Soneri should investigate; he only wants to get up to the mountain woods and look for mushrooms. But it isn't long before Paride's body is found in those woods after having been shot; shortly afterwards his father Pamiro is found hanging from a noose, an apparent suicide, committed after he'd shot his dog. Paride's death was no suicide -- so who killed him? Although Soneri is there to find mushrooms, he can't help but to get involved. As one character notes, "everything is linked to the pig-farming business, and even politicians come out smelling of pork and salame." The same is true for the savings of many of the people who lived there: Pamiro, the local pork manufacturer and leading source of employment for the most of the people in the area since the war, has been scamming money from the locals for years. He had been promising them a better return on their investments than the bank could offer them. But before his death, Paride has been running the business, and the people fear that they will never see their money again, and for most people, it means a loss of their retirement funds. It is definitely a motive for murder, and the Carbinieri have a suspect: a man called the Woodsman, a crack shot and former childhood friend of Pamiro, who also invested money with him. The Woodman's wife died because he didn't have the needed money to get her help. Soneri's not so sure; after all, there is a town filled with suspects, not to mention Paride's unhappy wife. There is little to nothing on the negative side to say about this book. Varesi is a master of atmosphere; from the village piazza to the swirling mists that rise on the mountain to envelop a solitary hiker, this book sets the reader firmly in the Appenine valley and mountain forests as winter is approaching. The valley is a place where long-time resentments and secrets are buried, but really only just beneath the surface, still simmering in the minds and memories of the people who live there. His character portraits rise above the usual -- especially in the old men of the village, for whom the valley has and always will be home and who lament their childrens' exodus to the city, as they wonder if their way of life is fast approaching an end. Varesi also does a splendid job in capturing the personality of Soneri as a loner and introvert who just doesn't want to get involved, but who can't help himself when it comes to seeing justice done. Soneri's personality emerges much more fully in this novel than it did in River of Shadows. The book also has consistently good pacing, the plot is credible and the ending is appropriately revealed considering the rest of the story. I liked River of Shadows, but not nearly as much as I enjoyed this second book of the series. Varesi's forte is definitely setting and atmosphere and both books convey his talent in this area, but he's also managed to create a lead character in Soneri that here more fully establishes him as a person. Crime fiction readers who prefer a good mystery, intelligent writing and atmosphere in their reading will definitely like this one. If you're looking for a thriller-type novel, this isn't it, move along. I look forward to more of Varesi's books in translation -- after all, not all of the good crime fiction these days comes just from Scandinavia. Oh, Nancy, you've got me intrigued! I need to read more Italian crime fiction and this seems like an excellent choice. I liked the story in the first book, but Soneri came across as well, I described him to Maxine as a 'cold fish'. This time he's got much more of a personality. 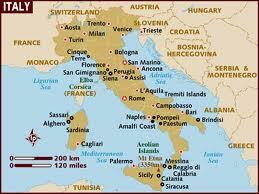 I'm just getting rolling on the Italians -- stay tuned.